Celebrate the United States Mint’s 225th anniversary with a brand new design that remembers our past and embraces the future! This new design featuring an African–American woman as Lady Liberty is a fresh take on our Nation’s cultural roots, the traditional allegorical representation of Liberty, blending one of the most important symbols of our past with the creation of a modern American symbol. This new coin embraces our Nation’s founding principles that “all men are created equal … with certain unalienable rights, that among these are Life, Liberty and the pursuit of Happiness.” Join us as we celebrate this anniversary with a newly “minted” American symbol, the culmination of 225 years of progress and artistic vision. 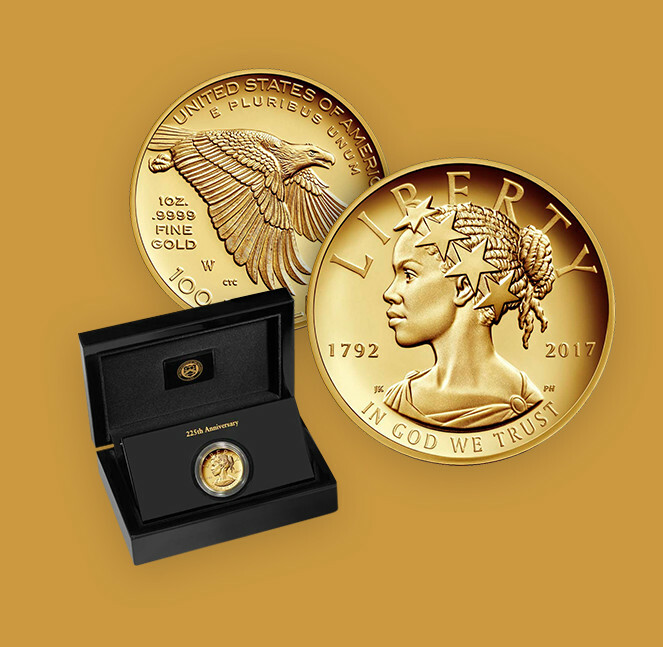 Designer Justin Kunz has crafted a modern classic in his depiction of Liberty on the 2017 American Liberty 225th Anniversary Gold Coin. This 99.99% 24–karat gold coin is the first high relief coin with a proof finish ever minted by the United States. Each coin is hand packaged in an exquisite black–lacquered hardwood presentation case and is accompanied by a companion hard–cover book detailing the fascinating numismatic history of our Nation’s most cherished symbol.